ANKARA, Turkey -- A pro-government Turkish newspaper on Wednesday published a gruesome recounting of the alleged slaying of Saudi writer Jamal Khashoggi at the Saudi Consulate in Istanbul, just as America's top diplomat arrived in the country for talks over the Washington Post columnist's disappearance. The report by Yeni Safak adds to the ever-increasing pressure on Saudi Arabia to explain what happened to Khashoggi, who vanished Oct. 2 while visiting the consulate to pick up paperwork he needed to get married. U.S. Secretary of State Mike Pompeo told journalists before leaving Riyadh on Wednesday that Saudi leaders, including King Salman and his son, the 33-year-old Crown Prince Mohammed bin Salman, "made no exceptions on who they would hold accountable." "They made a commitment to hold anyone connected to any wrongdoing that may be found accountable for that, whether they are a senior officer or official," Pompeo said. But he admitted that he had learned very little about the actual case of the missing journalist from his meetings in Riyadh. "I don't want to talk about any of the facts," Pompeo told journalists. "They didn't want to either, and they want to have the opportunity to complete this investigation in a thorough way." The top U.S. diplomat said he felt it was "a reasonable thing to do to give them that opportunity and then we'll all get to judge. We'll all get to evaluate that work that they do." As he prepared to leave Turkey, briefing reporters on the plane, Pompeo continued his silence on key details and questions and said this isn't about giving Saudis the benefit of the doubt. "I keep hearing that we're giving them some benefit of the doubt," Pompeo said. "They're going to do an investigation. And when the investigation comes out we'll evaluate it. It's not about benefit of the doubt, it's that it's -- reasonable to give them a handful of days more to complete it so they get it right." Pompeo told reporters to be "mindful" of the meaning of the Saudi relationship in the region. "The Saudis have been great partners in working alongside us on these issues," Pompeo said. No major decision has come from the ultraconservative kingdom's ruling Al Saud family. Khashoggi had fled the country last year amid the rise of Prince Mohammed, whom he wrote critically about in the Post. The report in the Yeni Safak newspaper cited what it described as an audio recording of Khashoggi's slaying, which it said showed the writer was tortured. CBS News has not been able to verify the reporting by the newspaper, which is close to President Recep Tayyip Erdogan. The paper said Saudi Consul General Mohammed al-Otaibi could be heard on the tape, telling those allegedly torturing Khashoggi: "Do this outside; you're going to get me in trouble." The newspaper said one of the Saudis allegedly torturing Khashoggi replied: "Shut up if you want to live when you return to (Saudi) Arabia." Al-Otaibi left Turkey on Tuesday afternoon, Turkish state media reported, as a search of his residence in Istanbul by Turkish investigators was reportedly delayed by Saudi officials neglecting to give official permission. Interior Minister Suleyman Soylu told the state-run Anadolu Agency on Wednesday that Saudi Arabia has "accepted" a request for a search of the official residence but had not yet given its final consent. Soylu said: "As soon as (Saudi Arabia) gives the consent, steps will be taken toward investigating." That consent was finally gained later on Wednesday, with Turkish police entering the consul's residence to conduct a search. "Here we go again with you're guilty until proven innocent," Mr. Trump told the AP in an interview. CBS News chief White House correspondent Major Garrett says President Trump has thus far given the Saudis every benefit of the doubt, and taken almost no visible steps to seek hard evidence about the possible murder in their Istanbul consulate. The administration continues to defer to the Saudi timetable and to the kingdom's approach to fact-finding, instead of demanding the involvement of U.S. investigators or backing the Khashoggi family's request for an international investigation. That leaves the unmistakable impression, says Garrett, that the White House is bending over backwards to accommodate Saudi appeals for time to explain what many fear was a brazen human rights violation. Mr. Trump's attitude, however, does not appear to be shared with Congress, as one prominent Republican senator said he believed that the crown prince, widely known as MBS, had Khashoggi "murdered." As CBS News' Pamela Falk reports, the White House -- and the U.S. Congress -- have more power than ever before to act against a rogue state or entity deemed guilty of violating someone's human rights. Congress could press Mr. Trump to block arms sales or suspend military cooperation with Saudi Arabia in Yemen, downgrade political relations, or some combination of any of those measures, using the Global Magnitsky Act of 2016, which gave Congress the ability to request sanctions that would previously have been impossible due to diplomatic immunity. The Washington Post has published the blurred passports of what Turkish officials claim are members of a 15 man Saudi team alleged to have played a role in Khashoggi's death. Unverified reports suggest one member was a forensic doctor, and the New York Times is reporting another has close links to the crown prince. The Times said it had confirmed, using facial recognition software, a database of Saudi mobile phone numbers and other means, that at least nine of the 15 men worked for the Saudi security services, military or other government ministries. One suspect, Maher Abdulaziz Mutreb, was a diplomat assigned to the Saudi Embassy in London in 2007, the Times says, citing a British diplomatic roster. Mutreb has been photographed recently emerging from planes with the Saudi crown prince, the Times said. He was also photographed standing guard during the crown prince's visits in Houston, Boston and the United Nations. Three other suspects, Abdulaziz Mohammed al-Hawsawi, Thaar Ghaleb al-Harbi, and Muhammed Saad Alzahrani, were identified by the Times report as members of the Saudi royal guard or part of the crown prince's personal security team. Some reports have even suggested that Khashoggi's body may have been taken from the consulate and disposed of at the the Saudi consul's residence in Istanbul. CBS News cannot independently verify those claims. Turkish officials have claimed for a week that they have audio and even video recordings proving that a Saudi team killed Khashoggi in the consulate, but it remained unclear on Wednesday whether any audio or video evidence had been handed over to or even seen by U.S. intelligence agencies. 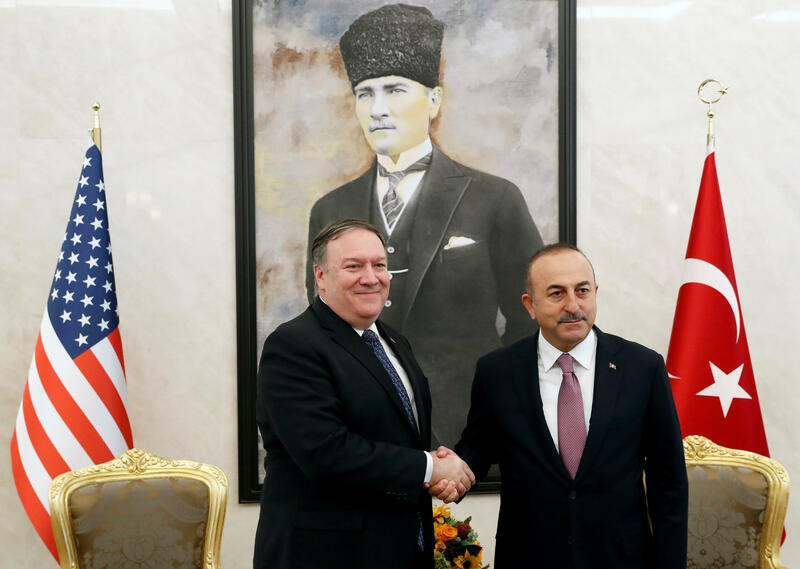 After Pompeo's meeting on Wednesday with Turkish Foreign Minister Mevlut Cavusoglu in Ankara, the State Department issued a statement saying the secretary of state had, "reiterated the United States' willingness to assist Turkey in its investigation of the Jamal Khashoggi case." As CBS News correspondent Holly Williams reports, it was only on Monday -- 13 days after Khashoggi went missing -- that the Saudis even permitted Turkish investigators into the consulate. But that didn't stop the smiles -- and laughter -- as Pompeo met on Monday with the crown prince, who called the two nations "strong and old allies, so we face our challenges together." Police still planned to search the Saudi consul general's home, as well as some of the country's diplomatic vehicles, Turkish Foreign Minister Mevlut Cavusoglu said. Leaked surveillance video shows that diplomatic cars traveled to the consul general's home shortly after Khashoggi went into the consulate. Earlier Tuesday, U.N. human rights chief Michelle Bachelet said the "inviolability or immunity" of people or premises granted under the 1963 Vienna Convention on Consular Relations "should be waived immediately." That convention covers diplomatic immunity, as well as the idea that embassies and consulates sit on foreign soil in their host countries. Mr. Trump's previous warnings over the case drew an angry response Sunday from Saudi Arabia and its state-linked media, including a suggestion that Riyadh could wield its oil production as a weapon. The U.S. president has been after King Salman and OPEC to boost production to drive down high oil prices, caused in part by the coming re-imposition of oil sanctions on Iran. Pompeo was dispatched to Saudi Arabia and Turkey on Monday, immediately after President Trump had a phone call with the Saudi king, whom he said denied any knowledge of Khashoggi's fate. But after two weeks of flat denials from the Saudi regime of any role in Khashoggi's disappearance, two sources close to the kingdom confirmed to CBS News later on Monday that the Saudi government was planning to admit he was killed, but call it an accident. That could, like Mr. Trump's softening comments, seek to give the kingdom a way out of the global firestorm of criticism over Khashoggi's fate.